Each autumn the Loki Schmidt Foundation in Germany announces the flower they have chosen as ‘Flower of the Year’. I was pleased to hear that for 2017 it will be Papaver rhoeas, the Common Poppy, or Field Poppy as I know it. We are fortunate to see it growing wild in corn fields and around the edges of agricultural land near us. But in some regions it has all but died out. The intense use of fertilisers, pesticides and herbicides, along with other modern technology in farming methods, mean the conditions no longer exist in which this wild flower can colour our fields and roadsides. A couple of years ago this was the view just beyond our garden gate. Not just poppies, but sweet peas, chamomile and cornflowers were mixed in with the crop. 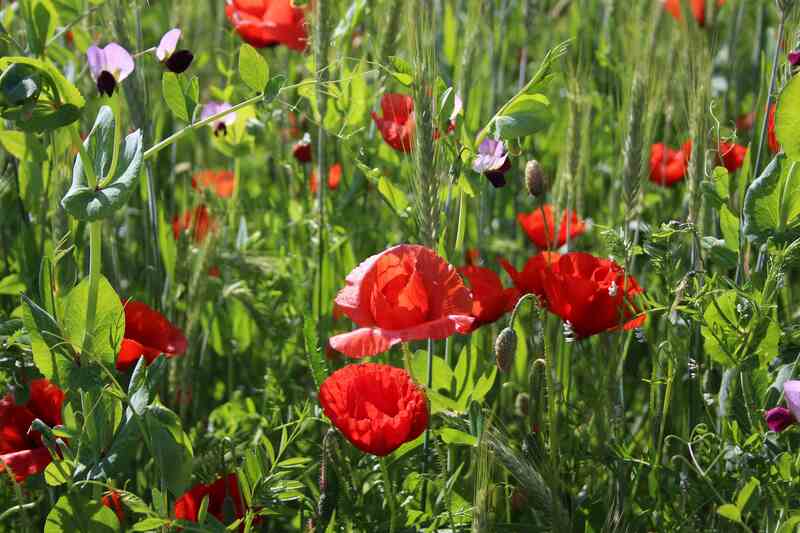 And this summer several farmers started sowing strips of wild flowers along the edges of their crop fields to encourage wild bees and other pollinators, insects and wildlife. This is subsidized by the EU – I only wish they would offer subsidies for NOT deep plowing, fertilising, and spraying chemicals or slurry on the land year in year out! The idea of this Flower of the Year campaign, called ‘Blume des Jahres’ in German, is to draw attention to the plight of certain flowers which are slowly becoming endangered in our countryside. I hope it helps with awareness, as it would be tragic to lose more of our beautiful wild flowers. Which wild flower would you miss most of all? The poppy perhaps? This entry was posted in Countryside, Nature, Plants and tagged Botany, Countryside, Environment, Germany, Plants. Bookmark the permalink. A sight to make the heart sing! How wonderful to have that view. The red really sings out. The poppy is a favourite of mine. My grandparents had a farm and the fields were like that. Literally packed full of quaking grass, lilac lady’s smock and yellow buttercups. They were water meadows that flooded every winter. In summer I would pick armfuls if the flowers for my grandmother and they would be lovingly arranged in vases at home. Such a happy memory. It’s my ambition to plant a wildflower meadow at home. We’ve made a start with our lawns which no longer have fertiliser and weedkiller treatments. They are awash with wild violets and primroses just three years after stopping the treatments. Pop[[py fields forever! Very fine choice. I think everyone loves to see those bright splashes of red – they have inspired so many painters too! Thank you Mihrank – it is a lovely sight indeed. I love poppies in the garden, but I don’t think of it as a wildflower, exactly. I think I would miss Asclepias tuberosa most of all. Does it still grow near your home in the wild too? We don’t see milkweed here. You can still find it in open lots, along roadsides, etc. Not as easy to find as it used to be. I wish they did that here. When I think back to when I was a child, we have lost so many wild flowers, will we ever get them back again, I doubt it. There is still hope, and these EU subsidies are some of the most useful I have heard of… I will have to get some photos of those field edges next spring and write about it! My favourite view in June! There are plenty of poppies fields in my region. That is good news Anca! Great choice Germany. At the garden where I work we have turned an area back to wildflower meadow and it is a delight to see native orchids returning. Native orchids are rare here too, unless you travel further east of us into the Bavarian Forest where there are beautiful wild flowers everywhere! I can´t imagine a world without poppies. I would miss blue cornflowers. Do you know paintings of the painter Emil Nolde (German Expressionsm)? He is famous for his poppies. What a sight for sore eyes! I’m with Dorris, the growing colonies of wild orchids in the rough grass are special treasures. As you say, a few changes in the way we garden/manage meadowland can make such a difference. Yes, and on a small scale it can be a huge help too. I hope the flower strips around the edges of crop fields will take off, as they are being given lots of support with regionally specialized seed made available to the farmers. I love the sight of poppies in a field. I don’t have a field or the poppies, but I still love them. Thanks for sharing. You’re welcome John. Yes, they are always a lovely sight when spotted in the countryside! What a great effort! I hope it will prove a success. Over here, many communities have taken to planting wild flowers along our highways. This is especially true in Texas and the practice has created tourism. And speaking of Milkweed, six states from the Midwest to Texas has created the Monarch Butterfly Highway, planting flowers to help the Monarchs make their trip to Mexico. Hopefully, this practice will continue in the US and Germany and spread around the world. I love poppies and am very lucky to usually have thousands flowering in fields near us. Not any more on the fields where the intensive farming is now taking place as he uses too much spray! There are still some fields that the industrial farmer hasn’t taken over so I hope we’ll still see some poppies. It’s there! Right before the last lap to the Emerald City. I do love poppies. The California poppy is a wildflower I absolutely adore. The last few years have been hard on the wildflowers because of our lack of rain. But not long ago I came across some poppies growing wild, deeper in color than the orange of the California poppy. I took photos of them and they made me so happy I enlarged the photo and have it hanging in my bedroom. I smile every time I wake to see it! I love the way Germany chooses a particular flower to highlight and call attention to it as one way to aid in its protection. Environmental conditions and farming technology has really created havoc for so many of our flowering species. How wise to think that farmers are bringing back strips of pollinating flowers. We are all just trying to understand the consequences of some of our decisions, aren’t we? Lovely poppies, Cathy! I love your orange poppies too, and have occasionally managed to grow some. It must be wonderful to see them in the fields – they are uplifting, and I quite understand why you had that photo enlarged! Time will tell if these strips of wildflowers have a long-term effect on the recovery of our wild bees – I fear it is just a whimsical trend that will fade out if not pushed further with subsidies and benefits for the farmers. My grandfather was a market gardener and I am sure he would be sorry to see how things have developed over the past 20 years or so. Thanks Amelia. The annual wild flower is a nice idea and I am sure it has some (limited) impact with campaigns such as postage stamps and calendars on sale, but it gets nowhere near enough publicity! 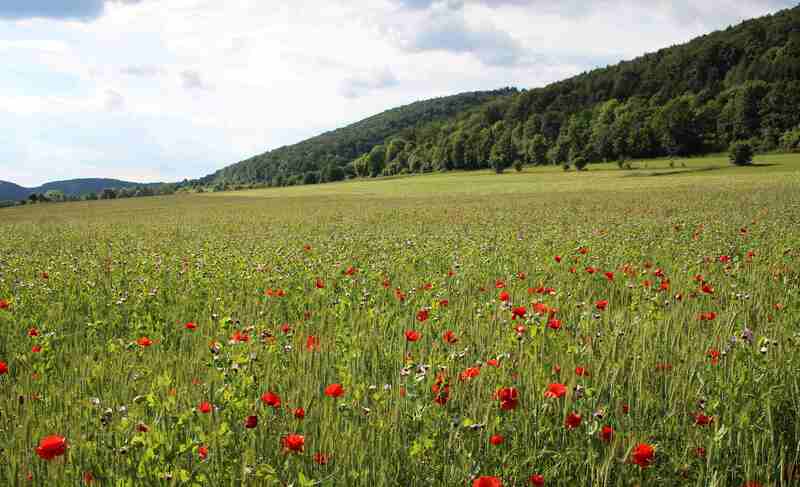 We only see the red poppy when a farmer has missed spraying herbicide on part of the field. The problem is millers do not what poppy seed in with the wheat. Although bakers will scatter a few on the top of a loaf. Isn’t it a shame that the poppies are disappearing from the countryside. I remember the smell of them as a child when we walked through the corn fields, crushing the unfurling petals between our fingers… with no fear of chemical sprays in those days! Smiling is good. And no doubt, the farmers will see the real benefits and will continue to do this without subsidies. It reminds me of programs that used to pay people to quite smoking. Obviously quitting is good for everyone, but if it takes a bit of cash to motivate you then I’m all for it. Everyone benefits in the end. A lovely piece and a very worthy cause. Poppies are all too often associated with doom and gloom and I think that anything that portrays them in their natural light is a worthwhile enterprise. I love to see them wherever I go.